Helen, a friendly, new-to-computers, 85-year-old woman, stands at the Ducktoes’s Computer Shop counter. She smiles awkwardly, more of a grimace than a smile. I know Helen, she bought a used computer from me about a year ago. At first she learned how to click the mouse, then she started playing solitaire, then I showed her how to do email, now she Skypes her children in Toronto and Newfoundland, and lately has started talking to her bridge group on Facebook. She’s told me she feels much less alone now that she can connect to her friends and family on the computer. We both laugh and make plans for George my delivery driver to pick up her computer the next morning and so we can remove the virus. 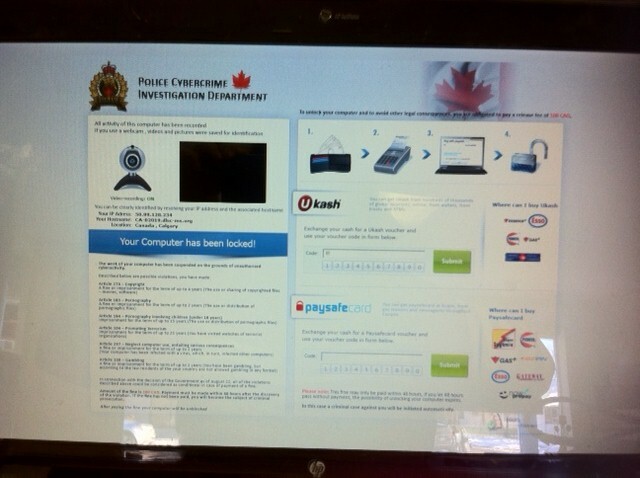 So if you see this warning on your computer, don’t go buy a gift card for the police. It isn’t from the police, it’s from criminals. Criminals that won’t be able to go to Canadian Tire to get out of their crimes either once they are caught. Ducktoes can remove this virus for you and you won’t have to wait a week or two. We can do it today at our shop or access it from anywhere to fix viruses or other problems remotely. We’re Calgary Virus Removal experts. Call 403-219-3031 or drop it by the shop at 902 Centre St. N.